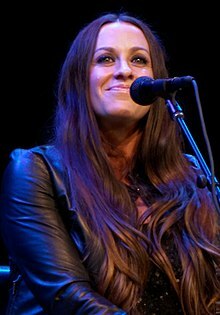 Alanis Nadine Morissette (born Juin 1, 1974) is a Canadian-American alternative rock sangster-sangwriter, guitarist, record producer, an actress. Morissette began her career in Canadae in the early 1990s, wi twa commercially successfu dance-pop albums. ↑ "Alanis Morissette becomes U.S. citizen: Canadian-born singer to maintain dual citizenship". Associated Press. February 17, 2005. Retrieved July 3, 2012. This page wis last eeditit on 29 August 2018, at 21:59.